Marking the fifth anniversary of the 9/11 terrorist attacks, the cover story warns that we in America have succumbed too easily to fear and, as a consequence, that we risk forsaking the very things for which we are fighting. Related essays discuss suicide attacks, counterinsurgency lessons from Algeria, protection for emergency responders, and public health preparedness. Marking the first anniversary of Hurricane Katrina, the publisher asserts a moral obligation to help the Gulf region over the long term. Other stories focus on unhealthy middle-aged Americans, unsafe small worksites of larger businesses, technologies for 2020, new refueling tanker aircraft, and the value of services obtained from the U.S. health care system. Jenkins, Brian Michael, Bruce Hoffman, David Galula, Henry H. Willis, Nicole Lurie, James A. Thomson, John P. Godges, Paul S. Steinberg, and Gordon T. Lee, RAND Review: Vol. 30, No. 2, Summer 2006. 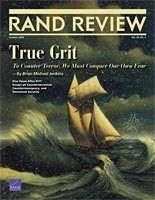 Santa Monica, CA: RAND Corporation, 2006. https://www.rand.org/pubs/corporate_pubs/CP22-2006-08.html.